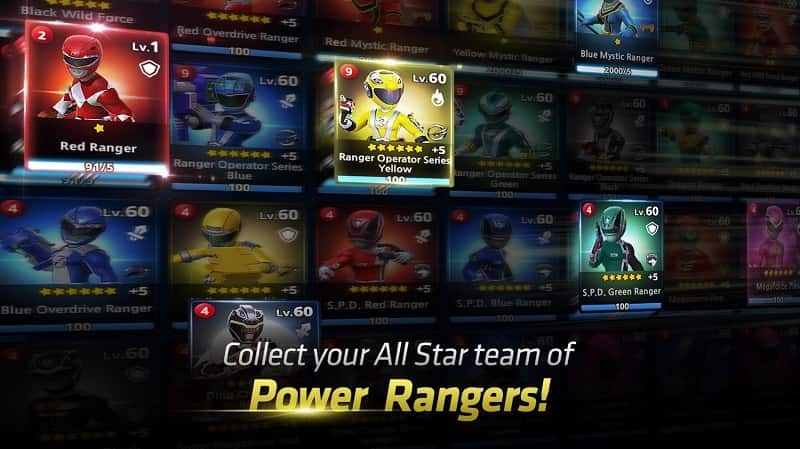 If you grew up watching Power Rangers and are interested in playing a Power Rangers themed game, it’s well worth continuing reading to discover everything that you need to know about downloading and playing Power Rangers: All Stars for PC. The red, yellow and blue Power Rangers from Power Rangers RPM find themselves in Corinth, which is the last inhabited city on Earth. There the three Power Rangers find that Professor Q has opened a dimensional portal to help the people of Corinth flee from their enemies the Venjix. However, the Power Rangers soon find that the portal, doesn’t lead to safety but to parallel dimensions which are teeming with evil monsters. In Power Rangers: All Stars you’ll be tasked with building a team of Power Rangers in order to battle and defeat as many monsters in parallel dimensions as possible! 1. You’ll get to play as over 50 different Power Rangers. As well as being able to play as current Power Rangers, you’ll also be able to play as Power Rangers from previous decades. So if you have a favorite Power Ranger, chances are high that you’ll be able to select your favorite Power Ranger to play as. You’ll even be able to play as a samurai Power Ranger. 2. You’ll be able to create tactical ranger teams. In order to beat formidable enemies you’ll be able to put together carefully chosen tactical ranger teams, who’ll be comprised of multiple Power Rangers. 3. It features multi-player team battles. 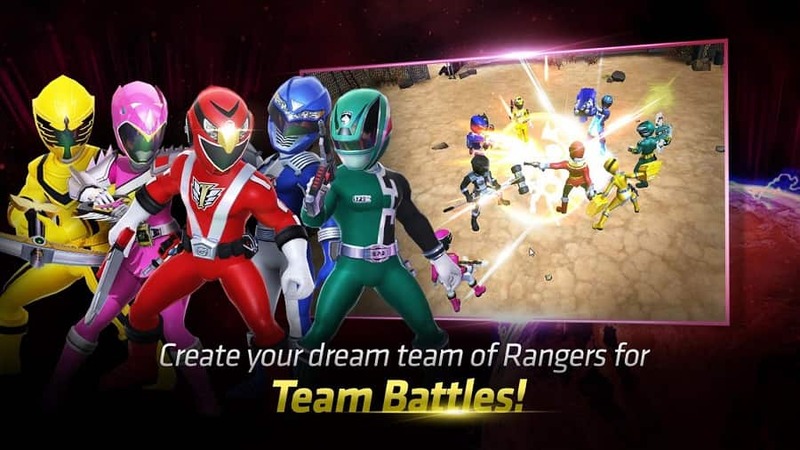 If you enjoy playing fast paced, exciting team battles, you’ll be able to work together with four friends to battle other Power Ranger teams in 5 player vs 5 player battles, which take place in the Dimensional Arena. 4. You’ll be able to form alliances. 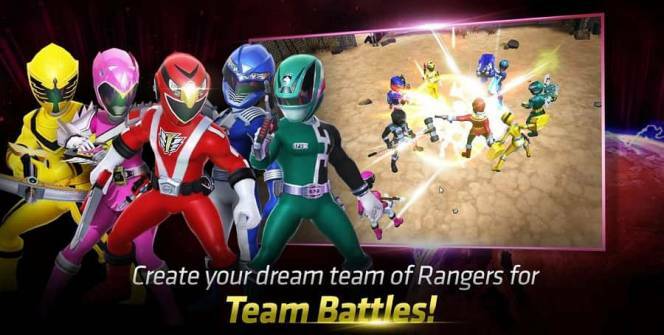 If you choose to play Power Rangers: All Stars you’ll also be able to forge useful alliances with fellow players. One reason why it’s well worth trying to forge powerful alliances, is that you’ll be able to take part in large scale raids, which offer bountiful rewards. 5. You can pilot different types of Megazoids. As part of playing Power Rangers: All Stars you’ll get plenty of opportunities to pilot powerful Megazoids. 6. There are a wide variety of dimensions to explore. Part of the fun of playing Power Rangers: All Stars is that you’ll be able to explore a vast variety of parallel dimensions. Each of which will boast different types of monsters for your Power Rangers team to defeat. As well as facing off against different types of monsters, you’ll also have to defeat technologically advanced weapons of warfare, which your opponents will try to use against your team of Power Rangers. Power Rangers: All Stars boasts the highest quality graphics of any Power Rangers themed game. Power Rangers: All Stars is updated on a regular basis. As an example, from time to time new Power Rangers are added. So if you’re a Power Rangers fan, chances are high that you’ll love playing Power Rangers: All Stars. One of the most successful Power Rangers titles to be released. Sometimes when playing Power Rangers: All Stars, bluestacks ask you fee to pay but gives you option to download some apps. Every time it asks you just select “Install apps” and continue using it free. I hope you enjoyed this article, please rate and share. If you have problems running Power Rangers: All Stars on your desktop or any other issues, leave a comment below.